Vladimir Gavrushov (cello), graduate from the Saint-Petersburg Conservatory (class of Professor Svyatoslav Zagursky). The Modus Quartet was created in 2004. It is headed by the Honored Artist of Russia, Professor of the Saint-Petersburg State Conservatory, Joseph Levinson. 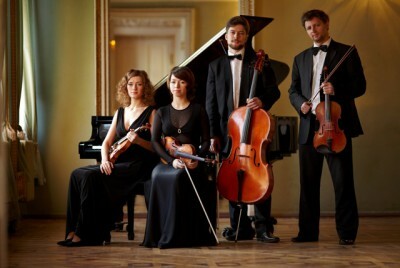 In 2006, the Quartet won the 2nd Prize at the competition dedicated to the 100th birth anniversary of Dmitry Shostakovich. It participated in master-classes of string quartets such as Fitzwilliam, Artemis Quartet. Modus is actively involved in the concert life and regularly appears on the stage in Russia and abroad. The soloists of the Saint-Petersburg Music House performed with a great success within “Young Russian Culture in Italy” Festival (Venice, Italy, 2008) and under patronage of Svetlana Medvedeva at the opening ceremony of Joseph Brodsky memorial plate in Venice (Italy, 2009). The concert repertoire of the Quartet is rather wide and includes musical works of various composers from Haydn to Bartók as well as compositions of the modern authors.